There’s a corny old Victorian song (music by Arthur Sullivan of G & S fame) called “The Lost Chord”, in which an organist, idly tootling on the organ, happens on a sublime chord that he can never after recapture. Benjamin Wood’s book is of an infinitely higher order than this song, but the same idea, that great art comes out of a mysterious universe of truth not accessible to ordinary people, is at the heart of The Ecliptic. It seems to be a theme of his: in The Bellwether Revivals, which I haven’t read, a central character is a musical prodigy with a messianic belief in music as an organising principle in the world. For Elspeth Conroy, the painter who narrates The Ecliptic, the lost chord is emotional truth, a personal truth that resonates with some form of universal truth. The struggle to follow this credo drives Elspeth, a celebrated young painter who despises the falsity of her own work, to such a crescendo of psychological distress that she leaps at the opportunity to get away from the world and enter the mysterious colony of Portmantle, on an island off the coast of Istanbul, where artists give up everything, even their names, to dedicate themselves to the creation of the great work they’re searching for. All, like Elspeth, are high achievers in despair; all are looking to transcend their own fame in total dedication to the artistic goal. They have no contact with the outside world and time here means nothing: Elspeth estimates, from the passage of the seasons, that she’s been at Portmantle about ten years, and she’s still experimenting to find the right medium for the great work she’s obsessed with. Her long-term companions – a playwright, an architect and a novelist – are the same. The arrival of a 17-year-old boy known as Fullerton upsets the balance and routine: he is farouche, disruptive and subject to alarming panic attacks. There’s a considerable build up to the arrival of Fullerton, but Wood doesn’t quite rise to the occasion. Fullerton is less that we expect. Later in the novel we see the connections retrospectively, but at this stage it feels as if Wood doesn’t quite know what to do with him. The timing falters, big events seeming truncated and out of balance with the assured movement of the earlier chapters. 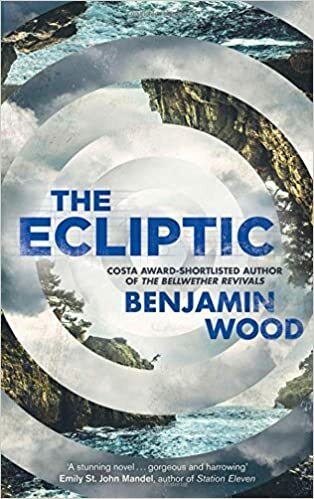 When the book moves back into Elspeth’s past, we learn that the ‘ecliptic’ of the title refers to something that’s become the focus of her artistic obsession. It’s an imaginary circle that represents the earth’s movement around the sun, but which we see as the path of the sun moving among the stars. The point is that it doesn’t exist in fact, but it does in our imagination, and it represents a truth about the universe. When working on a mural for a planetary observatory, she felt she must represent it, but she couldn’t work out a way of doing it that felt true to her. That’s the project she’s been working on at Portmantle. It’s an arresting image, but it feels too overtly symbolic for the book. Like Fullerton, its aura is bigger than its actuality. It’s an absorbing and memorable book for its portrayal of Elspeth and the perspective of a uniquely creative mind. Wood writes really well about painting and the world in which painters move. Around that, the structure creaks a bit. It feels overly-plotted and too neatly dovetailed at the end (as in the connection between Fullerton and the rest of Elspeth’s life that is spelled out). I’d prefer this any day to Donna Tartt’s work, to which Wood’s has been compared. He’s less showy but there’s more artistic integrity. Recommended. I was interested to see what you made of this one as I shall be trying it soon. I read The Bellwether Revivals. It was not without its problems. Good. I’ll be interested in what you say. It reminds me a bit of the vail that clouds our senses as we strive for revelation. The great work of art, the great literature or poem, the lost chord in the music. Interesting to tie it up in a novel. Yes, I thin all creative people know this feeling of striving to hit on something that feels true. It doesn’t often happen and even then only in little flashes. Despite your strictures — completely justified, I sure! — there’s enough here to tempt me, should I come across this, Gert! I once read a very interesting article on ‘the idea of the musical’ in Proust’, which touches on some similar themes. I wonder why Elspeth has decided that her work is false, what has led her to that conclusion? She seems to be of the mindset that her really good work comes out of some uncontrolled space, a kind of freefall if you like. When she works at things at the conscious level she feels she’s “engineering” the work. Because she’s so good technically, the work is highly praised but she doesn’t respect it herself and she doesn’t respect people who rave over it. I must say I’ve quite often felt something like this with good writers who seem to be pressing the technical switches – often very well – without a really deep engagement with a theme or a character.